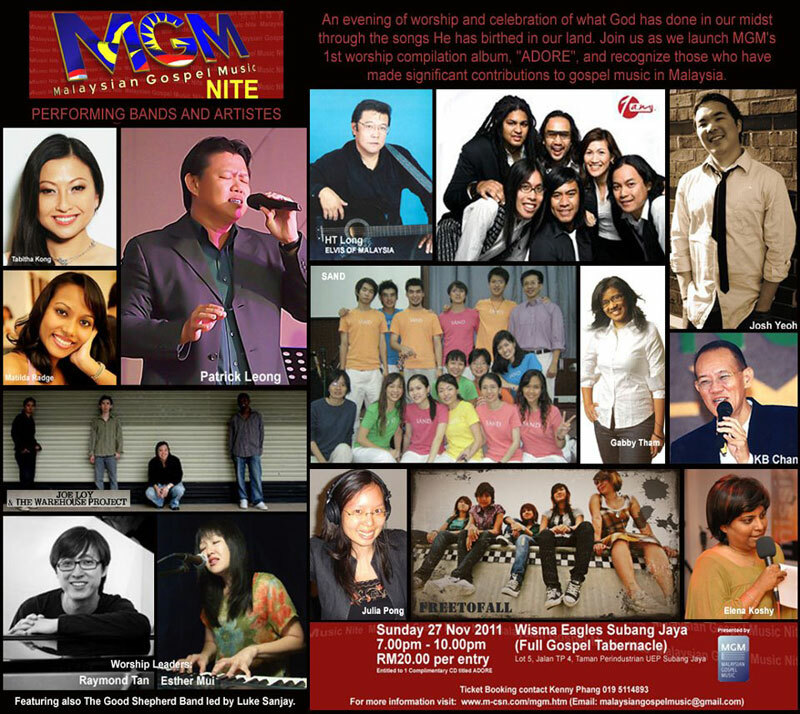 To advance and raise the standard of Gospel Music in Malaysia and to create a platform for Malaysian Christian artistes to make an impact in our churches, culture and community. 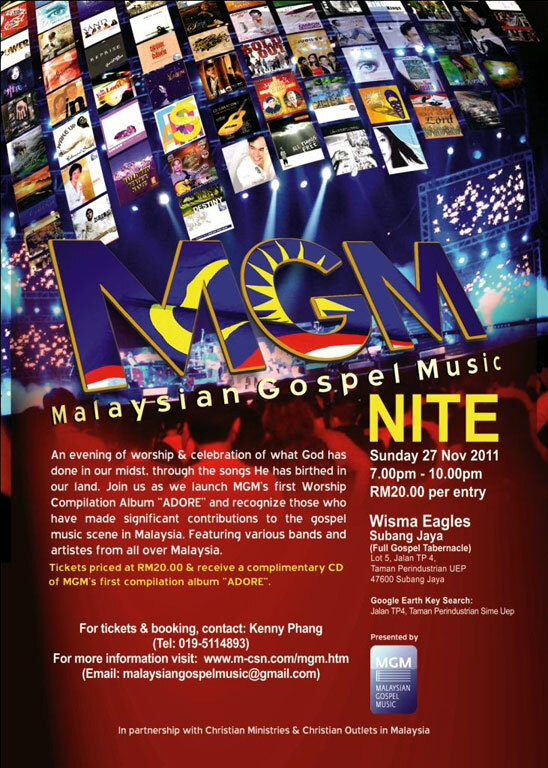 MGM is a fellowship of Christian artistes, musicians, songwriters, producers, and anyone associated with Gospel music in Malaysia. It will organize annual events and production of albums and songbooks. It is our endeavour to incorporate MGM as a legal entity: “MGM Network Sdn Berhad’ or as a corporation of appointed trustees. a) To raise the standard of Gospel music in Malaysia by guiding and assisting local songwriters to write and record excellent songs that will have maximum impact locally and internationally. b) Conduct workshops and seminars to teach and encourage local churches (worship leaders) to use the local songs in their worship services. c) To host and organize the annual Malaysian Gospel Music Award to recognize and acknowledge local artistes, musicians and songwriters. d) Showcase local talent through MGM-sponsored events such as the Gospel Music Award. e) Produce compilation albums and songbooks of local songs and distribute them through appropriate avenues. f) Market Malaysian Gospel songs and albums internationally. 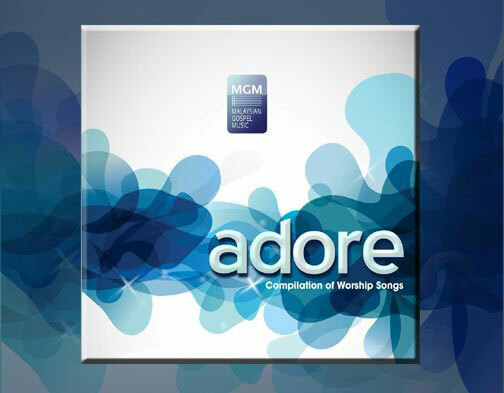 a) Set up a MGM website to feature all local gospel music albums, song books, musical events etc. This website will provide important information for musical events. b) Organize annual or bi-annual musical events. This event will include local and foreign artistes. The goal will be to show case local songs and bands. It will also be a musical award night for artistes and albums. c) Compile and produce albums of local songs and songbooks to showcase and promote the local artistes and their works to the churches and community. d) Promote local artistes to churches and marketplace (locally and internationally) so that those who produce albums will have an avenue to market them. e) Encourage local pastors on the need to use local songs. f) Conduct seminars so that local producers will produce good quality albums with good songs. The goal will be to reduce production of low quality albums. g) Generate profits and obtain sponsors to promote local Gospel Music. MGM will be guided by a steering committee which will give the overall guidance to the fellowship. For the organization of annual events, a working committee will be set up and this committee will run the events.